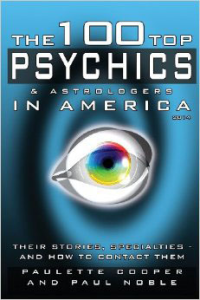 I’m happy to announce my inclusion in the new book, “The 100 Top Psychics & Astrologers in America”, written by Paulette Cooper and Paul Noble. As many of my readers know, this is my second time being included in this book, the last time being in 1994. I’ve done Psychic and Astrological readings for close to 250,000 people as of now, (including Trance Mediumship, Numerology readings and more). I’ve had the distinct pleasure/honor of reading many of the world’s most influential, and talented people. You can buy the book by simply clicking the link on the right-hand side menu of this site, beneath the “My Book Club” heading. Or, you can buy a copy, personally signed by me, by emailing me at my listed email address at the top right of this page. In addition, to being included in the book, I also created the official website, and all the media presence for the book. I’ll be putting together some appearances after Mercury goes fully direct on July 1st, 2014. Please “like” the book on Facebook, and “follow” us on Twitter. I will be featuring Paulette on one of my upcoming radio shows (Voxx The Psychic Show ®) and I’ll post links to keep you up-to-date. Just to let all my fans know that I am featured in the book, “The 100 Top Psychics & Astrologers in America 2014″. This is my second time being featured in this fantastic book, written by Paulette Cooper and Paul Noble. I also created all the social media for the book. I’m featured in a 3-page interview, which details my life as a Psychic Medium, (as well as Certified Tarot Grand Master, Astrologer and Numerologist). This book is full of great info, and also contains pictures and contact info for yours truly, and others. Paulette is a well-known author with experience in busting the “faux psychics” in the field. As such, it truly is an honor to be considered as one of the major talents in the upper echelons of such rarified company. Visit The 100 Top Psychics & Astrologers Official Site, for more info. Also, buy the book here! It makes for a great read and a wonderful gift. Send any and all Testimonials regarding any interesting readings you’ve had with me, over the years, and I will be including them in a new compilation.